Marquetry; the art of creating decorative designs on wood, using various veneers of contrasting figures, grains and colours as well as- occasionally- other materials such as shell or ivory- has been a staple feature of fine furniture for several centuries. Not to be mistaken with the similar decorative style of parquetry, which creates striking patterns with geometric shapes, marquetry utilises images of flora and fauna, birds, landscapes, human figures and intricate swirling patterns. 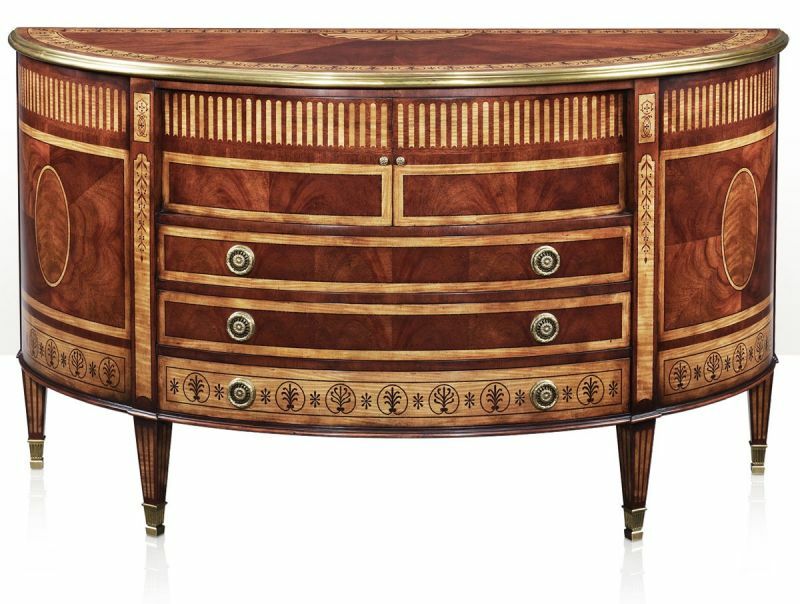 Marquetry has had an overriding influence on the design of classic English furniture since the fashion was first introduced from France upon the return of exiled Charles II. 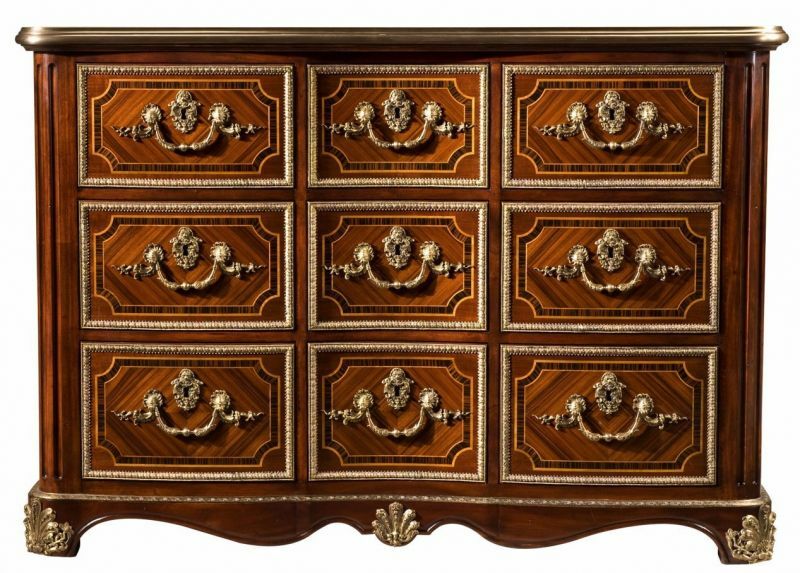 17th century French tastes account for much of marquetry’s prominence. During his reign, Louis XIV had his court decorated with floral and oceanic marquetry designs as well as parquetry pieces, all by iconic designers such as Boulle and Gole. 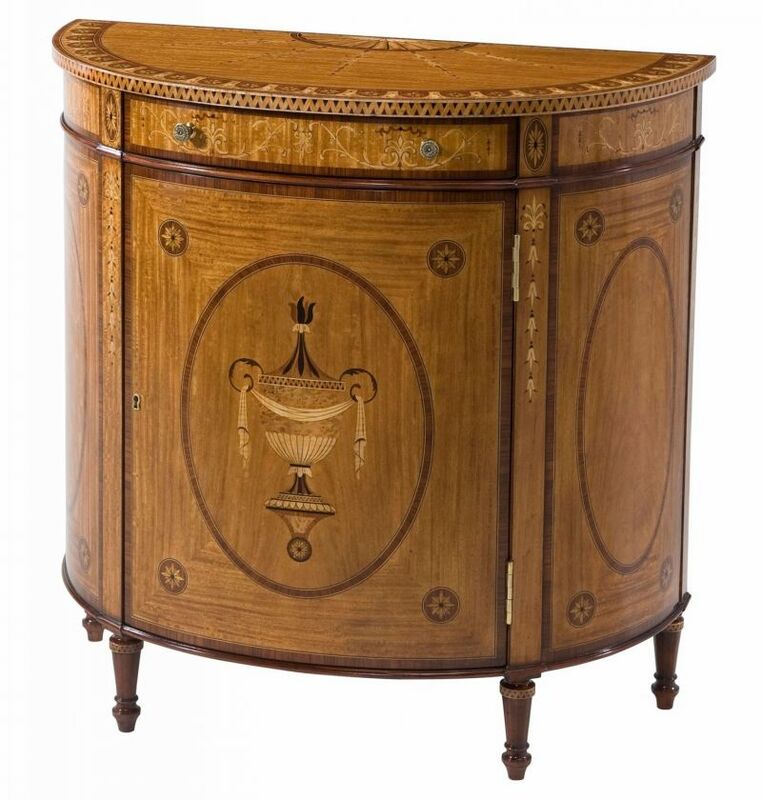 Across the channel, this sparked a revolution in English cabinet making and, by the early 18th century under the reign of Queen Anne, the vogue of marquetry was sweeping the stately homes and elegant properties of Great Britain. Despite these surges in marquetry furniture across Europe, the artform itself is a great deal older than many might expect. The art of marquetry and inlay can be traced back to intarsia; the ancient craft of creating decorative mosaics by inlaying precious stones or other exotic materials (shells, ivory etc) on to a solid wood groundwork. Although the precise origins of marquetry, inlay and intarsia are unclear, there is certainly evidence of ancient artisans using the technique as far back as 3,000 years ago. One of the most striking examples of marquetry being in use thousands of years ago is the tomb of Tutankhamun. When the Egyptian Pharaoh's intact burial site was uncovered, his sarcophagus, throne, chest, coffers and many items of furniture were discovered completely covered with inlay. Precious stones, miniature glazed tiles, marquetry inlay with exotic woods, gold and ivory embellished the world-renowned tomb. Even earlier evidence of the use of marquetry can be seen in other tombs around the world, especially in Mesopotamia, where incredibly intricate scenes can be seen cut into words of opposing colours and grains. 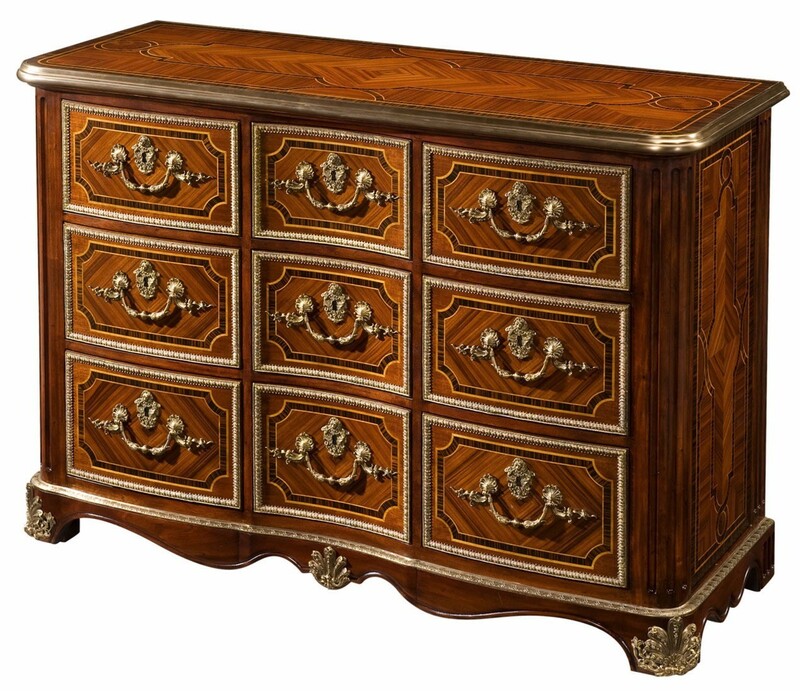 It wasn't until thousands of years later, during the era of European renaissance that furniture makers, once again, began to display beautiful imagery using contrasting veneers of wood as well as dyes and other materials. The surge in popularity that marquetry and inlay experienced during this time, as mentioned previously, may be found in religion. The decoration of churches was of the utmost importance in renaissance Europe and, in countries like Italy and France, the most renowned designers and craftsmen were called upon to create breathtakingly dazzling designs within places of worship. Examples of marquetry could be admired in the furniture these elegant churches even before the style began to grace the homes of the 17th century French aristocracy. From its ancient origins and through the changes in styles, techniques and tools over millennia, there is no question that the pinnacle of marquetry furniture occurred between the 17th and 19th centuries. French royal and aristocratic backing of the artform during this era caused it to reach the highest status, the work itself also became infinitely more refined with vast improvements in tools and techniques. It was around the beginning of this fashion that the term ?marquetry? came into parlance and became a household name. Over these two centuries, marquetry flourished, and the most fashionable members of society chose pieces of marquetry furniture for their properties. 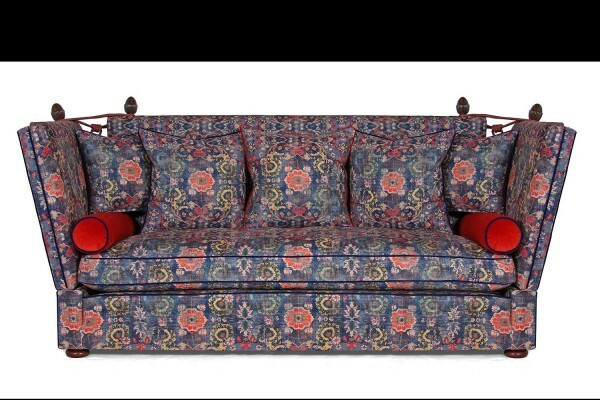 Trends, of course, changed along the way, for example, in the 18th century, the flower, foliate and acanthus patterns so beloved before were phased out in favour of more elaborate patterns- as designers developed more innovative tools and honed the craftsmanship of their work. 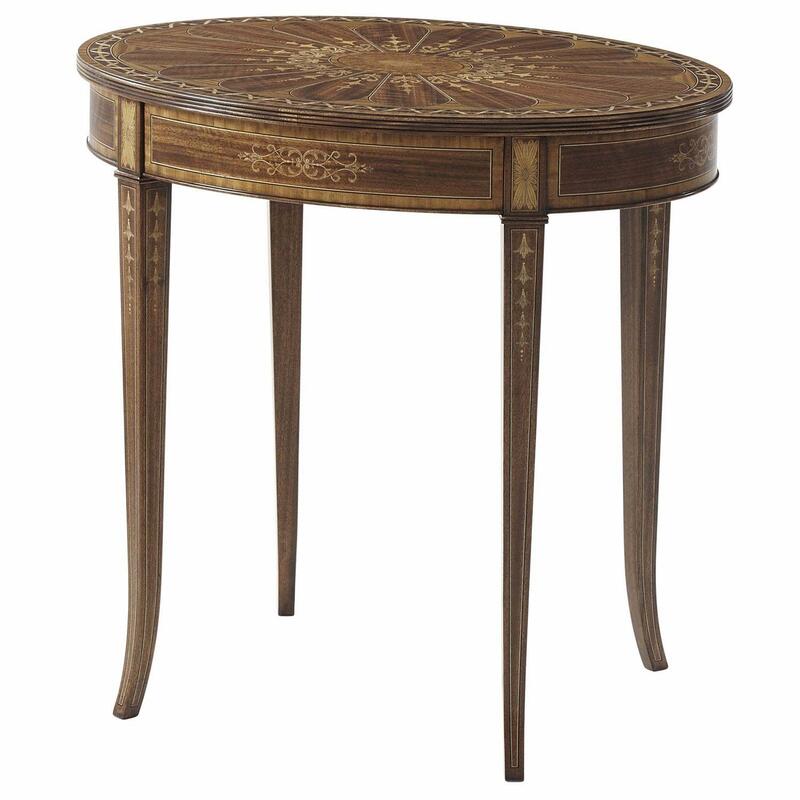 Known as 'seaweed' or 'arabesque', this style of marquetry was created with exquisite designs of swirling, scrolling, spiralling lines and foliage, such as can be seen in Brights of Nettlebed's Satinwood Banded and Marquetry Occasional Table. 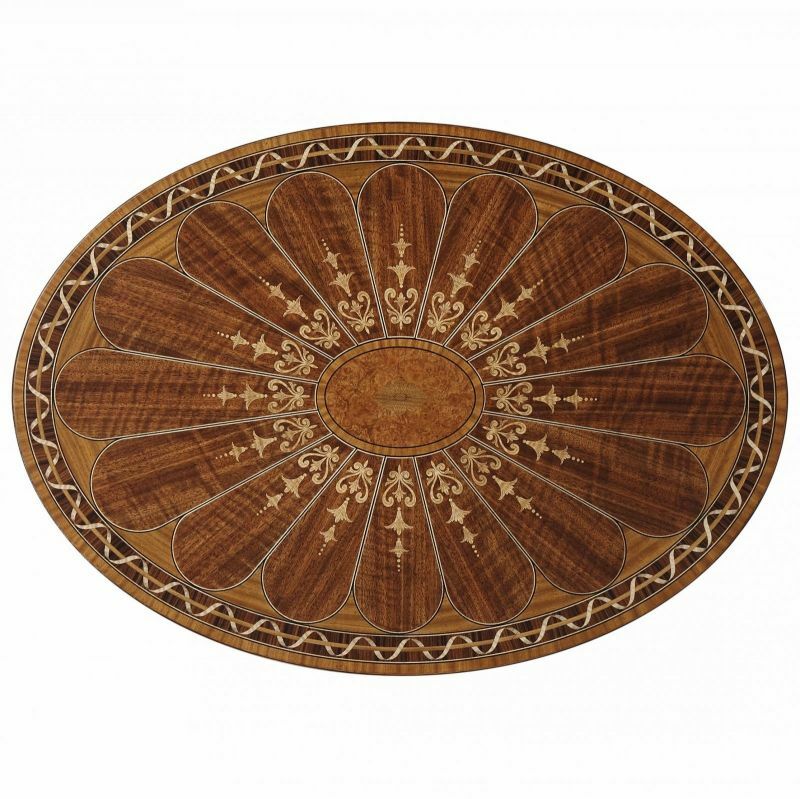 Marquetry is widely considered to be one of the most complex and time-consuming decorative processes. 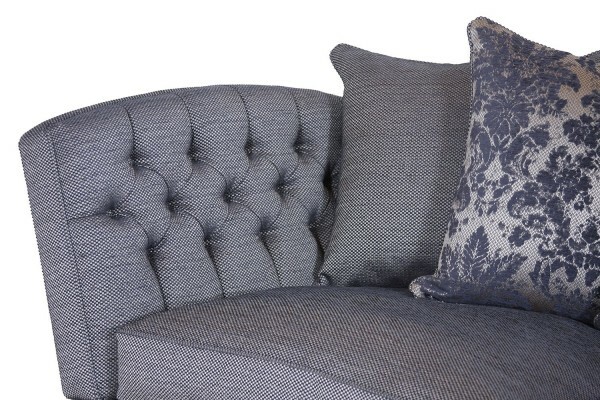 It comes as no surprise that only the most skilled craftsmen can create these intricate designs that characterise the style. The process involves drawing patterns on card and carefully pricking them onto the selected veneers before cutting the designs out to creating interlocking patterns. 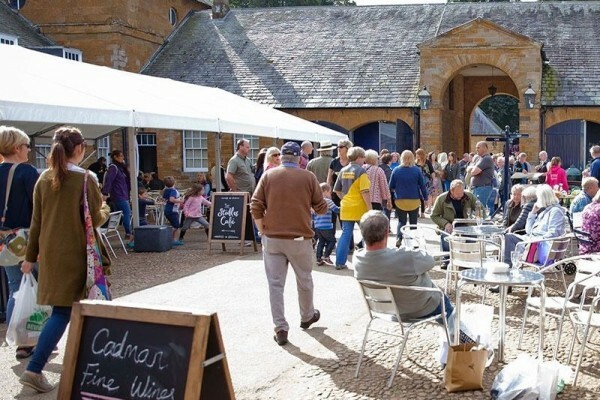 Today, only a select handful of accomplished marquetarians remain who are able to put the time-honoured, labour-intensive techniques into practice and produce work of the same high standards as the exquisite pieces which adorned mansions and palaces centuries ago. 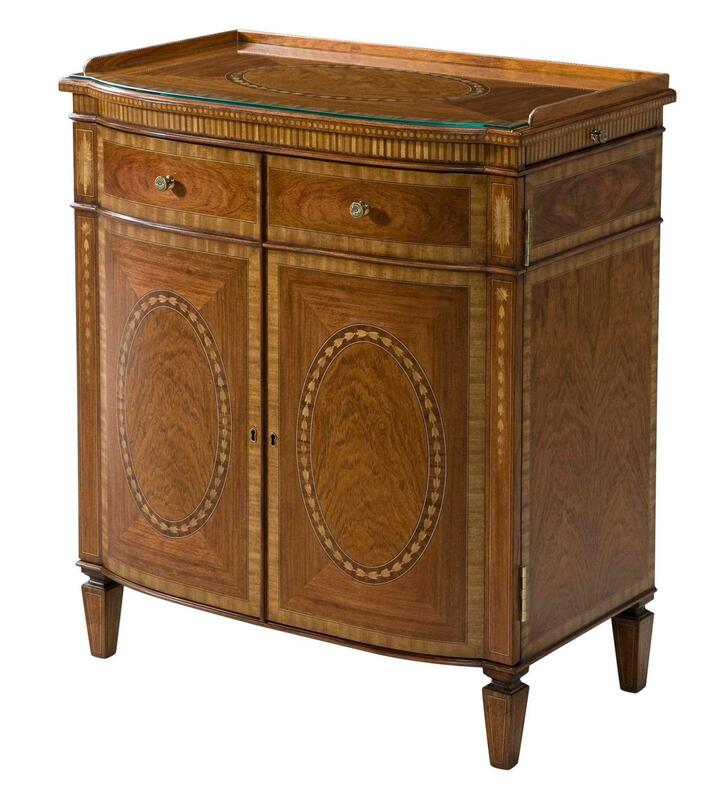 At Brights of Nettlebed we are able to provide an excellent selection of reproduction period pieces featuring marquetry and inlay designs which reflect the fashions of the 17th, 18th and 19th centuries. 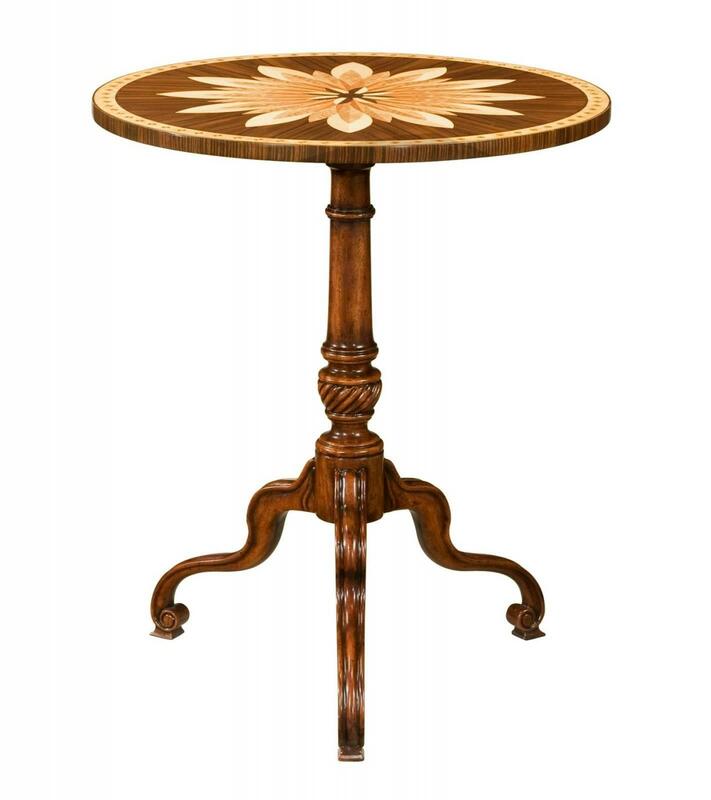 The intricacy, beauty and masterful workmanship of our marquetry furniture is why pieces, such as the Marquetry Inlaid Demi Lune Side Cabinet and the Mahogany Marquetry Tripod Table, are so highly sought after. 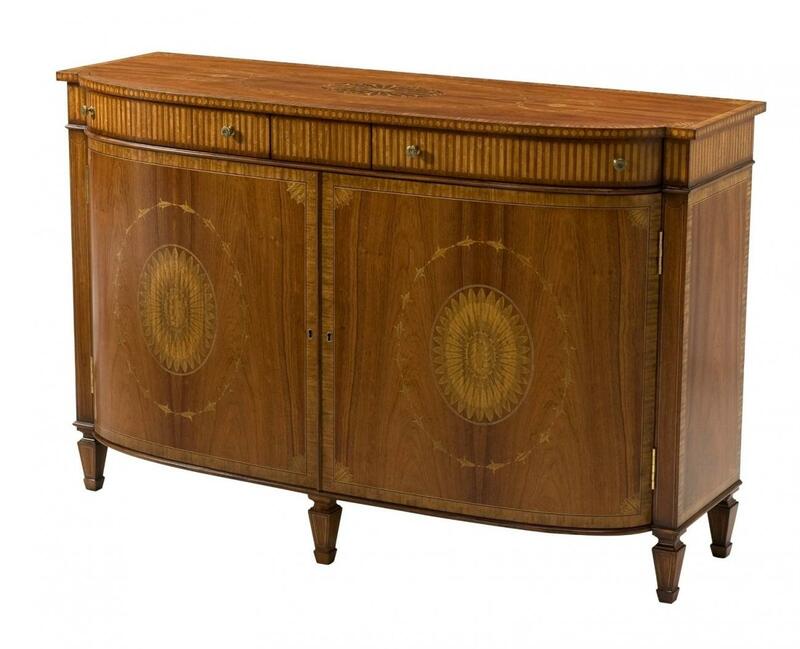 Our inlaid marquetry cabinets, tables and chests are ideally suited for any luxuriously decorated interior.